Greetings again, bundle-curious consumers. Apparently, Indie Royale decided to make sure all the mean kids didn't gang up and pinch them this St. Patrick's Day, and thus have donned their greens and proceeded to launch a new bundle that, while having very little to do with leprechauns, shamrocks and drinking, sure does pack a neat mix of games. This time, all of the games are fully loaded for Windows, and all but Hard Reset and Lair of the Evildoer make the jump to Mac. Everything is nice and Steam activated as well, except for DLC Quest and Lair of the Evildoer. 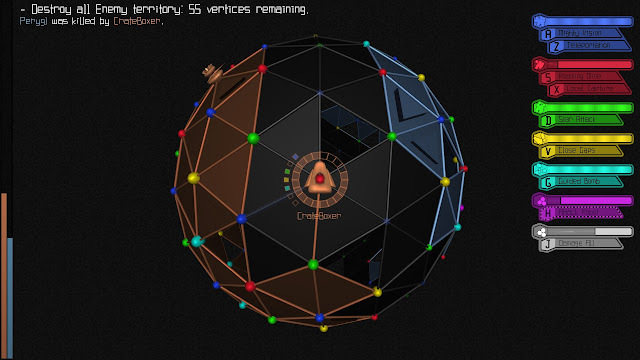 In terms of DRM free and Desura builds, only Vertex Dispenser lacks a Steam-free option. Unfortunately, this bundle can only offer Linux users a forlorn unhappy face. But hey, there is that new Humble to look forward to. Okay, are we thoroughly confused now? Great! Whistle a jaunty Irish tune if you must, and skip past the break for my impressions and reactions to each included game. It has always baffled me why cyberpunk is criminally under represented in video games, because it's a sci fi sub genre with all the trappings a video game could want. I mean, sure we have a few titles like Deus Ex and Syndicate, but it seems like cyperpunk has been largely confined to the realm of novels. Fortunately, Hard Reset does a lot to fill in the cybernetic hole left in our biomechanical hearts. Flying Wild Hog almost effortlessly captures the proper aesthetic for a cyberpunk shooter, and manages to make a competent, solid and fun shooter. I usually like to start by talking about gameplay, but let's stick it to the corporate Man and jump straight to aesthetics. Graphically, the game looks quite impressive for a smaller development team. Everything is sharply detailed, effects like explosions and electricity look great and the game does have a very detailed powerful graphics engine behind it. However, I was far more impressed with the level of detail poured into the game world. Like I alluded to earlier, Flying Wild Hog have perfectly captured what cyberpunk should look like, a feat that, in my opinion, hasn't really been accomplished properly since Blade Runner. Billboards plaster the sides of buildings, massive corporate satellites float by overhead, shopping consoles bark out ads and flash posters at you as you walk by and all the technology has that "80s future" vibe to it. There's also shabby buildings squatting under gleaming skyscrapers, flying cars, dark rainy streets covered in debris and everything else you could want. Even the graphic novel exposition between levels looks well crafted; while the game might not have the most original story, and it definitely hits all the cyberpunk beats, the presentation is solid. 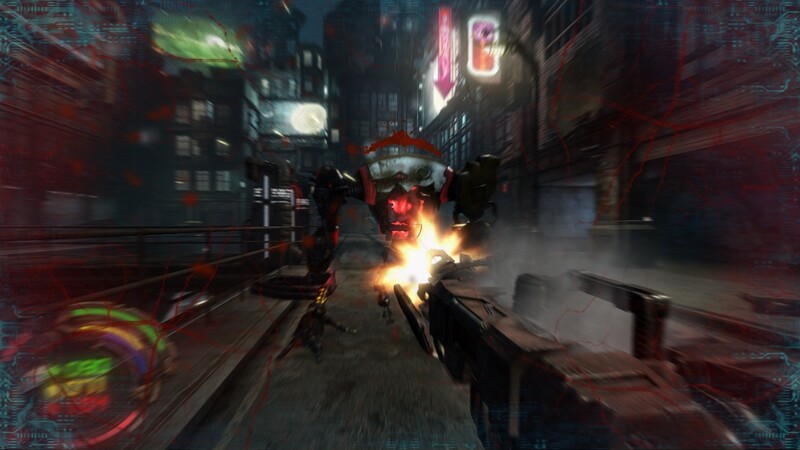 If someone ever wanted a reference to how a William Gibson game should look, then look no further then Hard Reset. The only real critique I can raise against the setting is the lack of people. The main antagonists of the game are machines, led by a corrupt AI straight out of The Matrix. While the robots are a satisfying enemy, their lack of humanity underscores the only minor flaw in the presentation. The city looks lived in, and not like a series of corridors with baddies to shoot. But this gets offset by the lack of citizens, allies or really any alive humans at all. This is explained away by an evacuation and lock-down, and might be explained away by budget concerns in the real world, but a bit of life to fill the lifelike city would have just pushed the setting to that perfect plateau. Moving back to the gameplay side of things, it's pretty easy to see the old school shooter influence that titles like Serious Sam and Painkiller hold over Hard Reset (Flying Wild Hog is actually made up of many ex-Painkiller devs). The gameplay, while fun, is pretty typical of most arcade shooters: run backwards and shoot everything that moves or makes a beeping noise. The robots are all influenced by the enemy designs as well; there's a bit of variety between models in terms of side and method of hurting. Like Painkiller, you pick up the enemy patterns quickly, allowing you to know when and how to react and you run and shoot. Had Reset also takes many similar systems from that title and works them into a more modern context. For example, the Painkiller practice of multiple firing modes gets expanded on a lot, leading to only two weapons with five firing modes each. 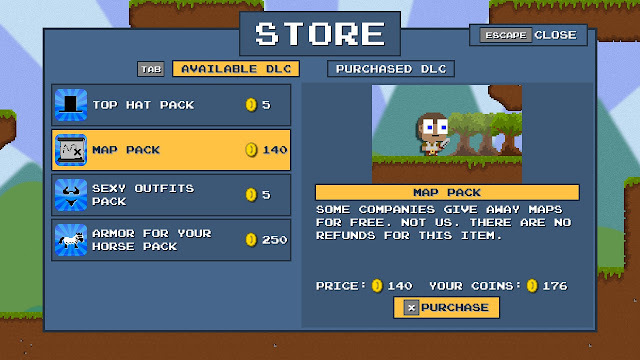 Another great example is the many secrets placed in each level, usually covered up by destructible terrain.There's also a bit of modern influence as well, such as an upgrade system for purchasing perks and upgrades. Still, any fans of Painkiller will feel right at home. Hard Reset is aesthetically impressive, without a doubt. The gameplay is also quite good; while it sticks pretty close to the Painkiller model, the idea of making an old school arcade FPS is something that doesn't come up very often. If you've been turned off of Painkiller by the less than stellar expansion packs, Hard Reset is definitely going to make you happy. 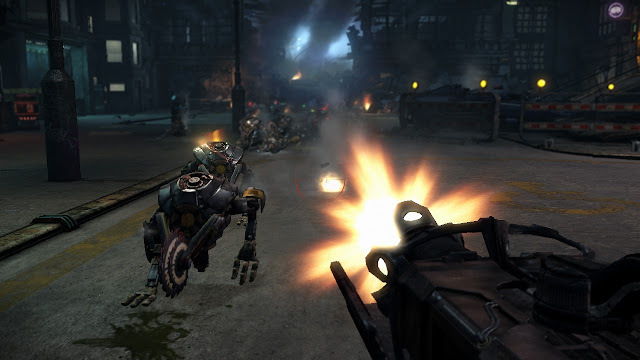 Even if you're just casually into shooters, Hard Reset is about as competent as any, and short enough to take on in an afternoon or two. It's definitely worth a few hours of your time. Did you ever stop and think to yourself, "Hey. You know what would make The Secret of Monkey Island way better? If all of the characters were dogs." No? Well I haven't either, but it's pretty clear that Brawsome has decided to interpret the phrase "scurvy dog" literally. If you're going to go aping the style of one of the most beloved adventure games of all time, you best bring a pretty great adventure game to the table. Luckily, Brawsome delivers an excellent product that favourably compares to its canine lacking inspiration. 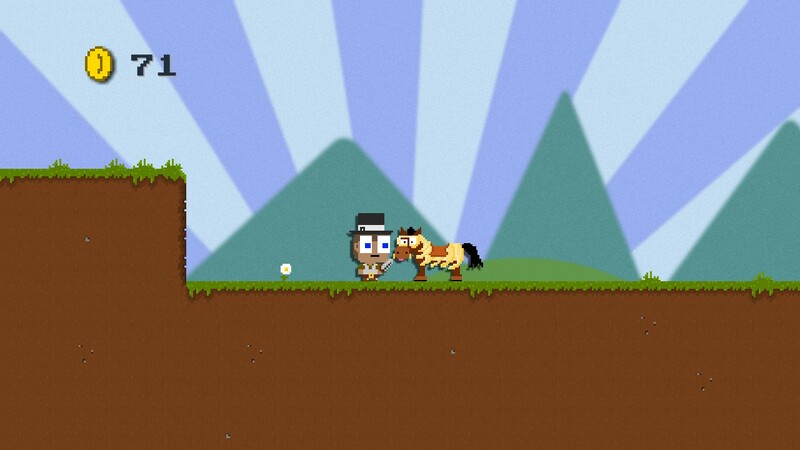 In Jolly Rover, you play as a delightfully foppish dachshund named Gaius James Rover. Rover certainly doesn't want to be a pirate, but fate and a pirate ship intervene to force him into the lead role of a swashbuckling adventure full of pirates, rum, cannibals and treasure. The plotline seems fairly simple at first, but gets slowly deeper and more intriguing as the game goes on. For the first half an hour of the game, I thought the entire adventure would be focused on escaping from the villainous Captain Howell's ship. Little did I realize that the ship escape is only a tenth of the entire game. It's not so much that the game is long, because I'd estimate about six to eight hours depending on how willing you are to use the hints. 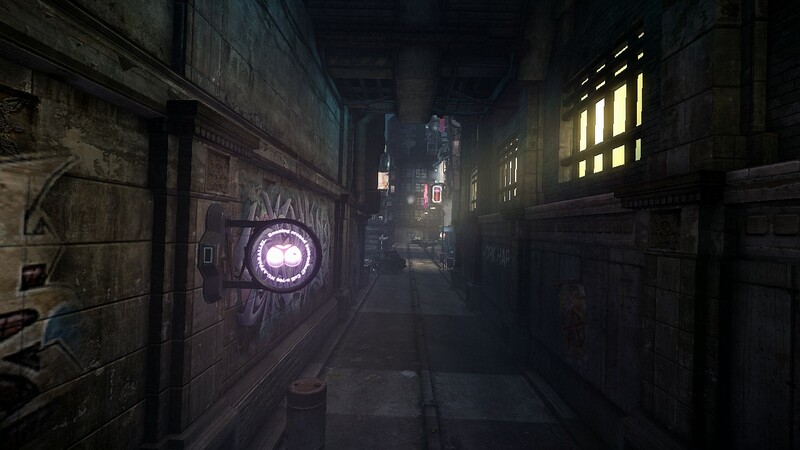 It's that the game has a very wide scope, covering several locations and puzzle narrative arcs. Each new area brings more mysteries, twists and puzzles to solve, and establishes more of Jolly Rover's backstory and world. I don't want to keep beating you over the head with just how much it is like Monkey Island, but that's undoubtedly the main comparison one can make. With the wonderful writing, bizarre puzzle solutions, amusing pirate humour and intriguing plot hooks, Jolly Rover could probably pass as a lost adventure of Guybrush Threepwood. The game doesn't even try to hide this either, as the script is packed with homages to Threepwood's quest, including a bizarre pseudo-reference to Monkey Island 2's legendarily polarizing ending. 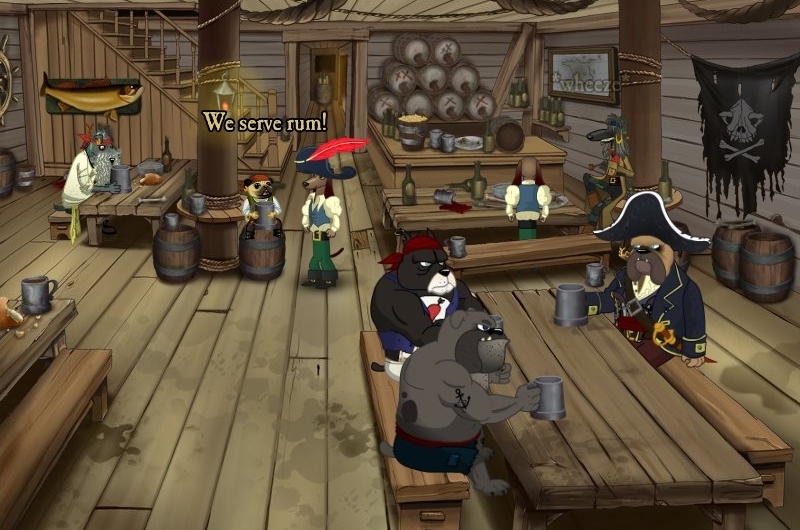 It might be a heavy influence, but I'd say Brawsome has done a great job of capturing the Monkey Island spirit, putting themselves at least on par with Telltale's revival. The writing is consistently amusing and entertaining, and the performances by the actors measure up to a fairly high quality standard. 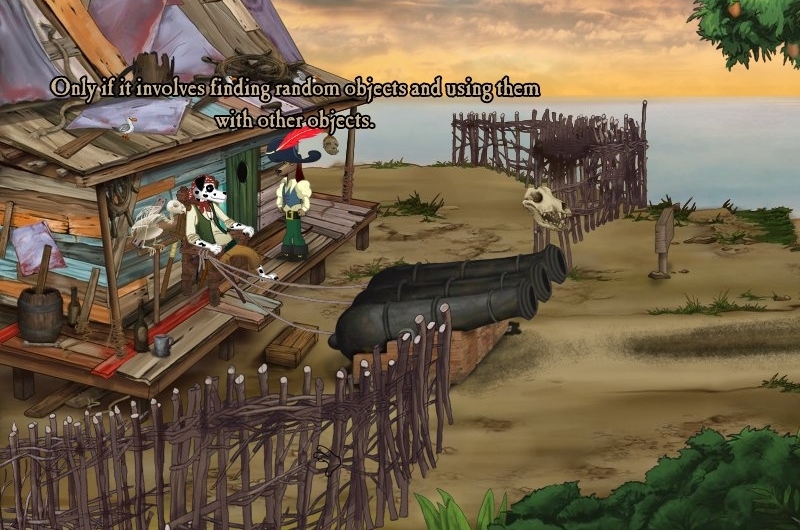 The humour is exactly the kind one looks for in an adventure game, and even manages to pull off a few amusing pirate jokes I haven't seen before. It's silly, cheeky, and constantly winking at the player. Graphically the game looks fairly nice, with only a few resolution problems and relative lack of animations holding back the 2D animated characters. However, I think the one thing Jolly Rover improves on a lot is pacing and flow. 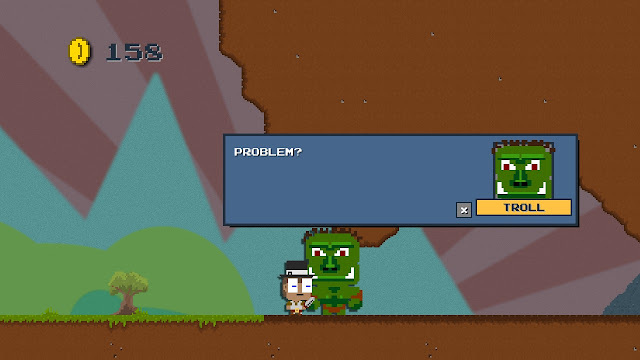 The game is loaded with tools to make sure the player is never stuck for too long. Simple changes like marking whether or not you've clicked an object yet, keeping the inventory relatively free of clutter and red herrings, offering a robust tiered hint system in the form of Juan the parrot, and relatively self contained and logical puzzles. Rarely will you feel like you need to use everything on everything in this pirate adventure, and no puzzle ever really leaps out as a stumper. It does make the game too easy for more advanced adventure game fans, especially if you use the hints at all. However, I think the benefits of proper pacing and ease of use outweigh the difficulty being lowered. As it stands, Jolly Rover could be easily enjoyed by anyone, which greatly expands the appeal for people unfamiliar with adventure games. Is it on par with such a legend as The Secret of Monkey Island? Probably not, but it comes a lot closer than most other indie adventure games I've tried. 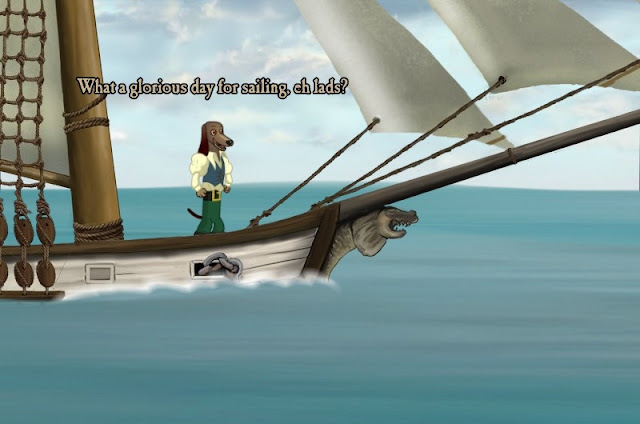 If you're a big Threepwood fan, or someone with a love for adventure game humour, or even just a person interested in trying adventure games for the first time, Jolly Rover delivers an amusing tale of old sea dogs that's worth checking out. Vertex Dispenser has a surprising number of hats to wear considering it's a pretty minimalist game. Michael Brough, the sole developer, incorporates elements from all sorts of influences, including real time strategy, puzzle games, just a tiny bit of top down shooter and that one paper game with all the dots and lines. It's definitely the most unique experience of the current Indie Royale. Vertex Dispenser revolves around a minimalist grid made up of triangles, shaped into some sort of 3D model and turned into a war of attrition. You want to control as much territory as possible, and remove as much of your enemy's turf as you can. There's a ton of different ways to accomplish this, and a lot of strategy in the way your dots, or vertices, get linked. I'll make it clear right now that I didn't get enamoured with Vertex Dispenser the way I did with the other games in the bundle, for reasons I'll get into below. But to counter that, I'll also say that I think it is a very smart, intelligent and well designed game. 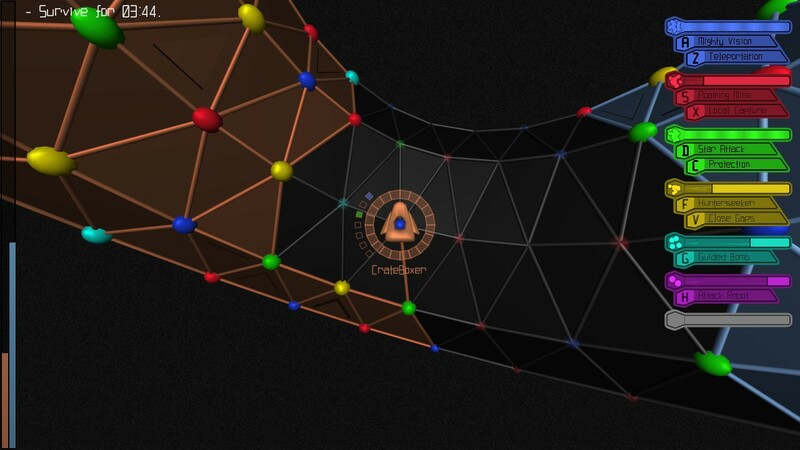 Basically, you move along the edges of the aforementioned triangles to create paths behind your ship. Moving to an empty corner creates a vertex, which will award you and your team with energy for particular special attacks. Filling in all edges of a triangle marks the shape with your colour, and turns it into your own territory. However, enemies can destroy your vertices by repeatedly attacking them, making each game a constant struggle to maintain choice vertex spots. Of course, you'll be assaulting their vertices as well, trying to tip the balance towards your own team's colour. Add in the need to explore and expand into unclaimed space, and the time to repair constant damage from harassing special attacks, and you are going to be one busy little spaceship. 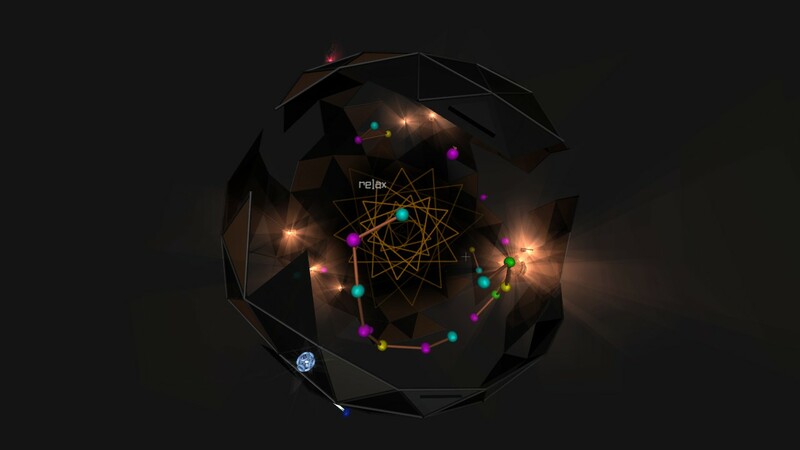 The puzzle elements come in through how a vertex is created. Each vertex is a different colour, with said colour comprehending to the lowest rank of power that can be legally placed. Same colours can not appear next to each other, so there's a sort of mini puzzle built into the game in terms of trying to set up your colours just perfectly and score energy for the best powers. Said powers are varied and require different deployment strategies; their effects can range from a protective shield for your ship, an ability that fills in any gaps you've missed for your territory, an attack robot to assist your cause or even a massive attack that heavily damages every enemy vertex on the field. With seven colours of energy, constant harassing from your enemy, a confusing puzzle to maximize your output and one or more additional mission goals, there's a lot to keep track of. The game does provide a bit of relief by allowing you to set powers to deploy automatically, but it's not quite enough. While I definitely appreciate the complexity and rewarding challenges the game offers, one big problem is the computer players. These bots, even with the difficulty turned down, can make decisions far quicker then I have a chance at. While I get that I need to be placing vertices in a specific order to maximize my combat abilities, the game runs at far too quickly a pace to actually plan this order out. It's not that the AI is challenging strategically, it's that the AI can remove that second of calculation a human mind needs, and therefore can swamp you more easily. Of course, this isn't always the case. I had great success in levels by simply moving constantly and setting all my specials off automatically. I just feel like I'm missing the strategic depths Vertex Dispenser was built for. However, multiplayer seems like an obvious solution to this problem, and playing games with teams of friends would be highly engaging indeed. Besides multiplayer and random battles, there is a campaign to work through as well as several practice modes to hone out specific strategies and become quicker to react. For a game clocking in at a minuscule 23 megabytes, there is a surprising amount of depth and content to work through. Still, I can definitely appreciate the design work that went into creating this very unique experience. It's a very distilled experience, almost exclusively focused on the gameplay and core designs and a bit alienating for the average player. If you have a real head for the memorization and math involved, you might find a neat new strategy to pick away at. Or perhaps you'll find yourself like me, betrayed by your feeble human mind. 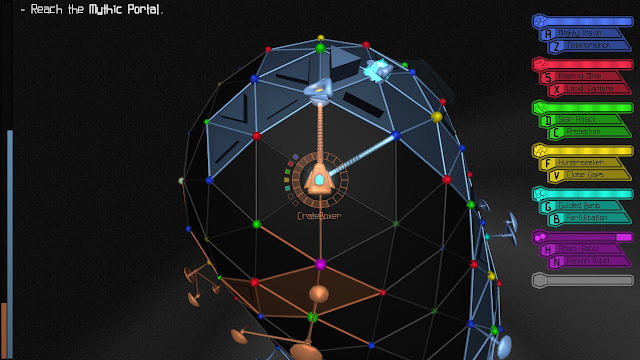 Also included in the bundle package is a bonus mouse driven spin off of Vertex Dispenser, titled Vertex Vortex Remix Cortex and classified as an abstract puzzle. It's surprisingly enthralling, and infuriatingly vague, but there is a pattern to the seemingly incomprehensible sphere. I won't say too much more, but it's mildly engaging to sit and stare until you see the pattern emerge in each puzzle, then work on manipulating the field to solve it. It works as a good brainteaser; very short, but puzzling enough to possibly try it once. Continuing the trend started by Soulcaster I and II in the previous flagship Indie Royale, this new bundle contains the debut of a PC and Mac version of DLC Quest, another acclaimed Xbox Live Indie Games title making the leap off of the console. Also like Soulcaster, it may very well be my pick for personal favourite in the pack. I, like everyone else who follows the game industry, sometimes have to shake my head at the ridiculous DLC that comes out these days. Sure, some of these packs are great, high quality expansions. But for every four hour bonus campaign, there's a dozen cosmetic enhancements or weapon packs. Somebody really needed to knock this practice down a peg, and Going Loud Studios decided to take a satirical swing at the entire industry. The result? A very clever, very amusing parody of the ridiculous expectations for modern gaming. Very much in the vein of popular Flash game Upgrade Complete, DLC Quest revolves around the player's quest to save the princess, all for a very reasonable price. The game is structured like the average Metroidvania, rewarding non-linear exploration with caches of coins and unlockable DLC to purchase. The satire comes in to play via the required upgrades to access new areas, sold by in game merchants Nickel and Dime. There's a ton of "DLC" to buy, ranging from the allegedly cosmetic upgrades of costumes and weaponry to the game halting omissions like the ability to move left. Without the jokes, the game would likely be a decent, run of the mill Metroidvania adventure. But the comedy of DLC Quest is a pretty huge selling point. The game includes jabs at just about every single DLC trope, knocking Capcom, Activision, Rockstar, Microsoft, Valve and everyone's favourite DLC punching bag, Bethesda "Horse Armour" Softworks. The satire is more bemused then malicious, which keeps the game from being overly critical and coming across as a moralizing lecture. DLC Quest doesn't really insult the practice of DLC so much as figure out a way to turn it into a fun game mechanic, allowing for a bit of silly satire in the process. I'm going to make a bit of side trip into the theory of comedy, but it is relevant so bear with me. One important thing to note about referential comedy is that it works far better if you build jokes out of the references, instead of just dropping a reference and calling it a day. With a few exceptions you can see from miles away, the writing tends to lean towards the former over the latter. However, what makes DLC Quest unique is that the game supports a lot of these references with jokes that show, instead of tell, through game mechanics. The idea of a company charging for premium movement to step to the left is funny, but actually experiencing a game that does so turns the joke from amusing to hilarious. I don't want to spoil too many of the DLC packs because most of them rely on surprising you with unexpected implementation in the worst places. It's all very clever, and supported by some pretty funny writing. As a game, DLC Quest is an amusing distraction, but as a roast of modern gaming from the perspective of an indie developer it's a bit genius, really. It's clear that Going Loud is pretty passionate about the games industry, and manages to pack in a lot of wry, funny observations about many of the industry's most infamous nickel and diming attempts. Also making a PC debut in the bundle is Going Loud Studios' prior game, Lair of the Evildoer. 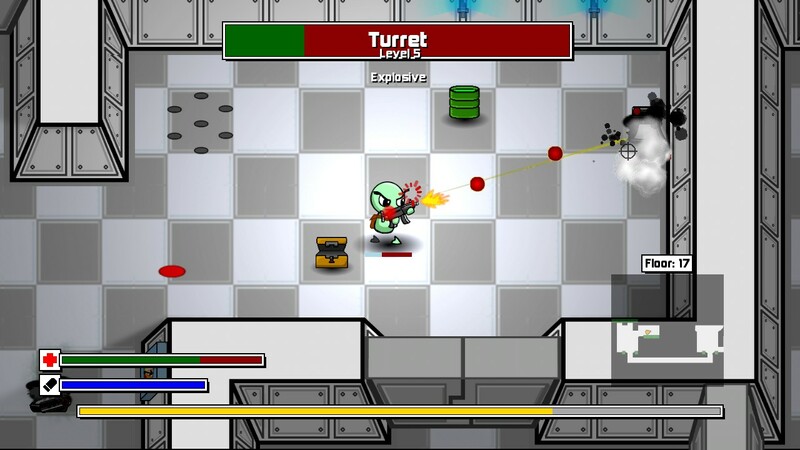 While on the surface it seems to be a pretty basic top down shooter set within a mad laboratory, the game takes some pretty deep influences from Diablo and other such action roguelikes. The implementation is pretty basic, but definitely more than enough to distinguish Lair of the Evildoer from the average top down shooter. As you control the escape of the poor experiment gone wrong, your character levels up, gains new stats and finds a variety of procedurally generated weapons to use. Interestingly, the game forgoes the use of an inventory, which makes deciding on loot a bit of a harder choice to make. Do you drop your Shotgun of Piercing to pick up a new SMG of Swiftness? Your character has a bit of leeway with slots for a heavy weapon, a side arm and a melee attack, but overall you've got to weigh the options based on what sorts of enemies you face. The presentation is modest yet good. Like DLC Quest, the writing is genuinely amusing at times; for instance, I have to say that I laughed out loud at the Enter Your Name screen and the vast majority of between level interludes brought a smile to my face. The titular evildoer is a stereotype of every ineffective evil genius in pop culture, but Going Loud manage to side-step many of the usual tired jokes by turning up the crazy in his insane ramblings between levels. 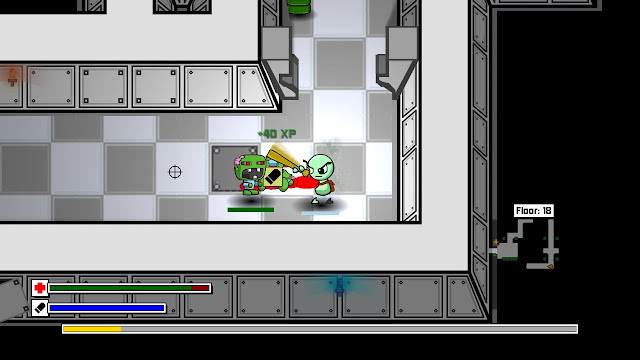 The drawings used for sprites are sharp and simple hand drawn images; the enemies and the good doctor look fine, but the player character is a bit dull. Some would say that the bold lines and simple designs make the game looks a bit amateurish, which might put some people off. However, you should really check it out anyway. The gameplay is solid fun, scratching that little itch inside all of us that demands sweet loot in exchange for shooting things. I wanted to commend Going Loud for the great PC versions of both this and DLC Quest. A lot of developers making the jump from 360 to PC forget to include some of the most simple options. Thankfully both DLC Quest and Lair of the Evildoer have been very well optimized in their PC incarnations, with basic options included like multiple resolution support and customizable key bindings. Going Loud did a great job catering to their PC audience; sometimes, it's the little things in a PC port that make for a great experience. Overall, I'm pretty impressed with this bundle. I went in not really sure what to expect and came away pleasantly surprised at the overall level of quality. I'll keep this ending brief because I want to get back to my Jolly Rover adventure, but I want to say thanks for checking out the review. If I sufficiently piqued your interest, be sure to pick up an Indie Royale of your own in the next three days. For more backlogging goodness, be sure to check out Backlog Journey out on Twitter, Facebook and Google Plus. In particular, stay tuned to Twitter to possibly win a copy of the St. Patrick's Day bundle for you or a friend. Thanks for the coverage. Was debating on some of these games as it didn't seem a lot of information was available about some of them. Time to go pick up the pack.